The Oasis is the result of the early expression of human ingenuity in a desert environment which has been applied since prehistoric times. 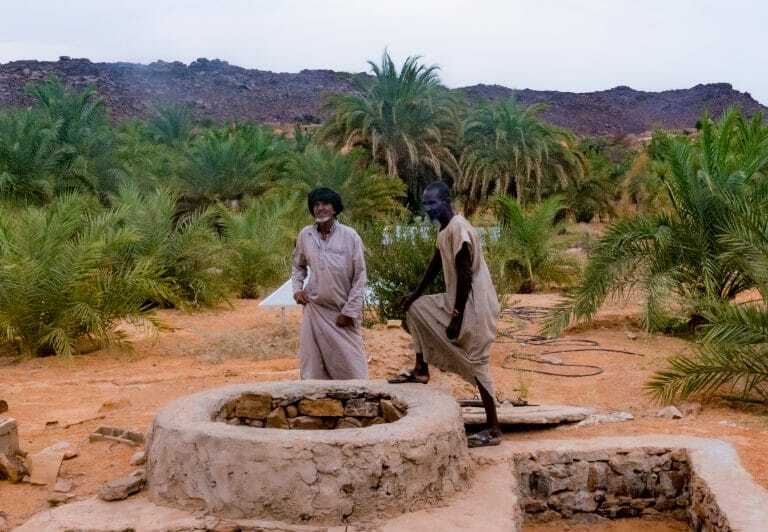 Since 3000 BC, water collection and management techniques, the pre-conditions for the establishment of a life cycle rooted in the cultivation of the date palm, have been handed down within the Saharan and Arab communities through shared customs. Hence, Oases were born: a heritage that has not only shaped the environment and the landscape, but also local history and culture, with common features that are recognisable even in different national states and across geo-political boundaries that were often drawn in the last century. Red Ochre prehistoric cave paintings decorate the entry of the Cattle Cave in Wadi El Beridj: cows, camels, one cameleer, eleven human figures, some of which are holding sticks. An example of the rock art, dating from 10,000 B.C. 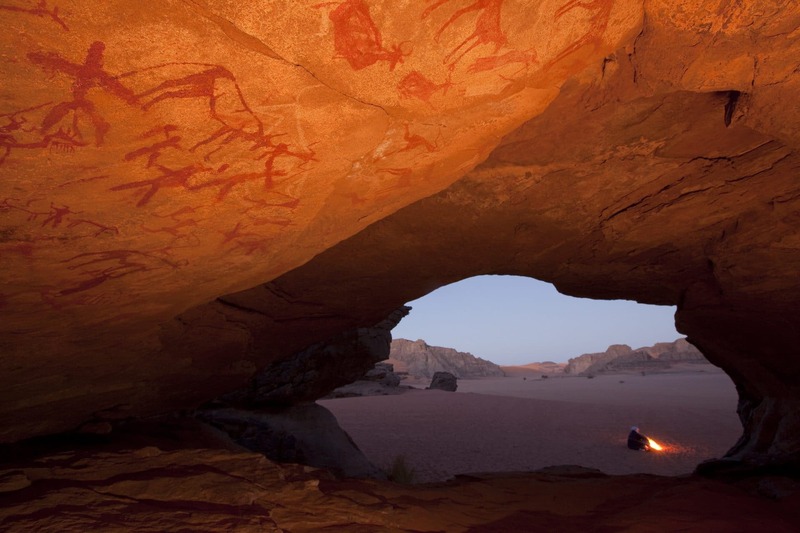 to the first Century A.D., found in the caves of Tassili n’Ajjer, where unknown artists tell the story of humanity’s origins. This mountain range has in fact been an historical crossroads of ancient populations, ideally placed at the centre of the Sahara, between Niger, Libya and Algeria. 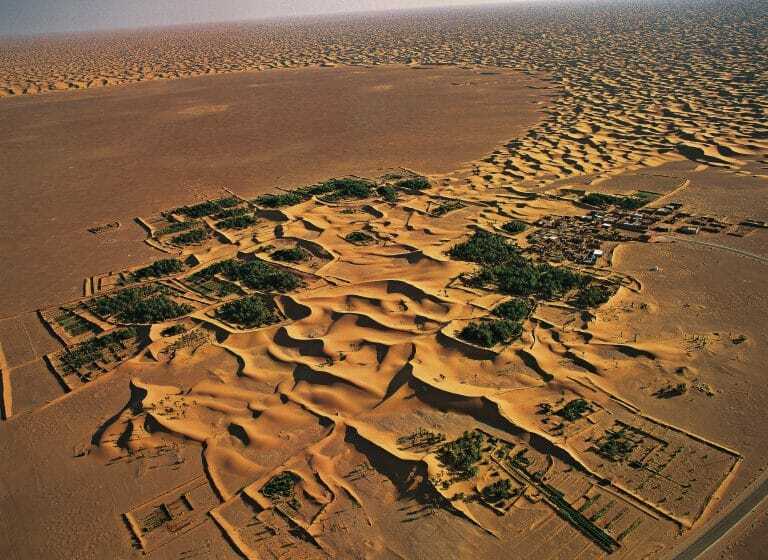 Hundreds of Oases, large and small, a long line of defence against the advancing desert, extending from west to east across the whole of Africa and in Arabia from north to south, largely still able of mitigating the effects of global warming. 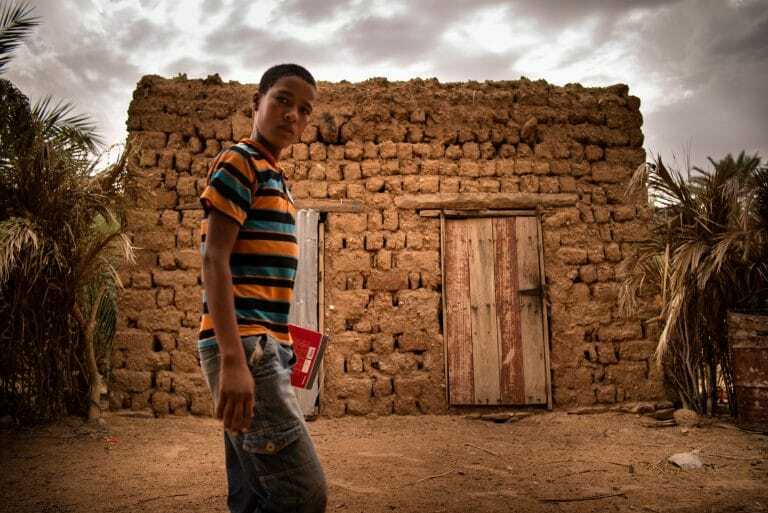 With one important benefit: contrasting the progressive desertification of large areas of the Sahel. The transition zone spanning from the Sahara to the tropical regions, increasingly uninhabitable because of drought, is the most severely affected by climate change and is the area of the African continent from which inhabitants of entire villages are in flight, migrants which we must inevitably consider as environmental refugees. 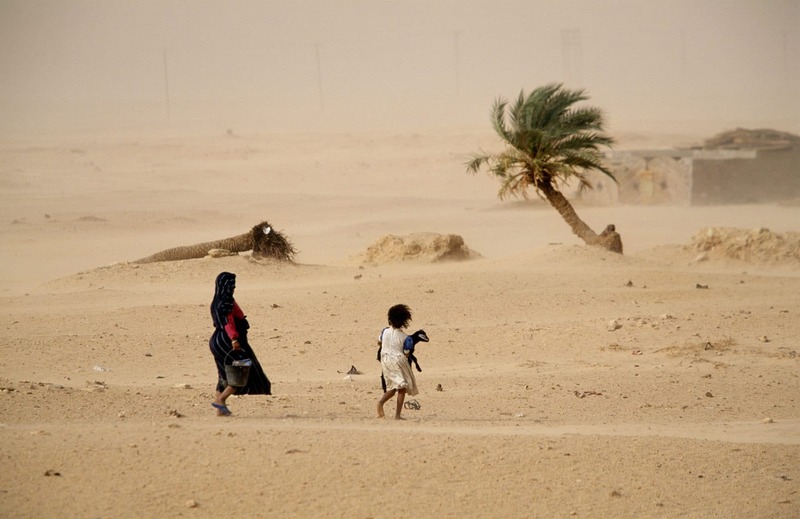 A mother and a daughter, holding a little lamb, brave a sand storm on their way home. The strength of the wind, which meets no obstacles due to the lack of plantations in farmland evidently in disarray, has just uprooted one of the last remaining date palm trees. 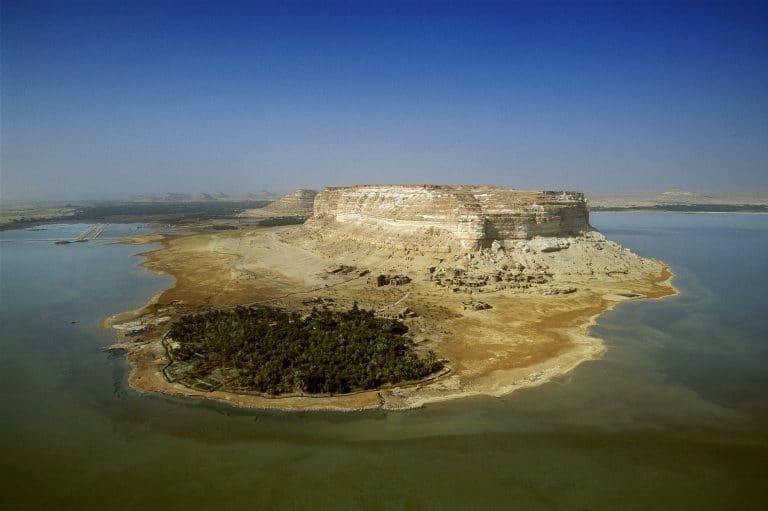 Constellation of Oases – a resource for the natural balance of the planet and for the geo-strategic balance of the whole Mediterranean area and Europe, ancient sites that in recent decades have been faced by the prospect of rapid, definitive disappearance. Emigration and desertification, but also their opposite, overcrowding and uncontrolled urban development, dwindling water resources, salinization and land degradation, are processes that global warming has accelerated in a short span of time. A concurrence of factors which, together with the loss of traditional knowledge, open a road of no return for these ecosystems, the fruit of an age-old history, yet extremely vulnerable. It is time to reverse this catastrophic trend. Alongside those who remain to guard places of such global significance, together with local communities and a network of partners such as NGOs, national and international institutions, universities and research centres, LabOasis Foundation works to safeguard the cultural heritage, the historical landscape and life in the Oases. 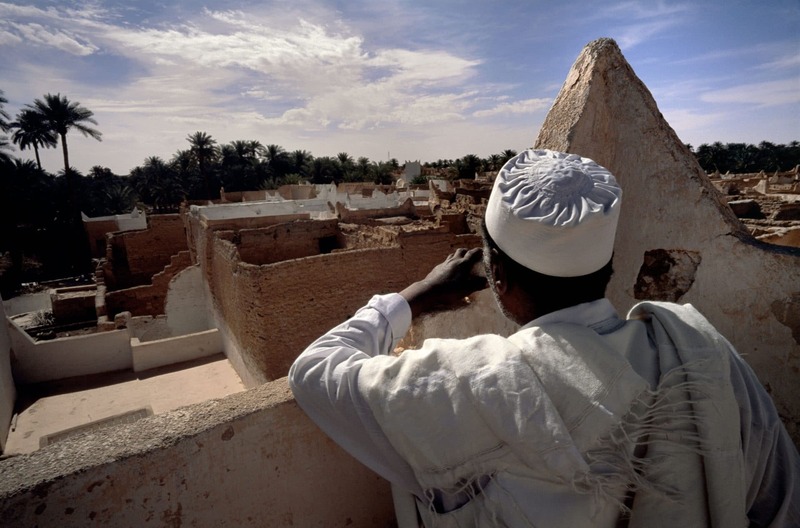 Looking out from the open-air roof-terrace of a building in the old town, a man surveys the labyrinth of 111 buildings in rammed earth and stone, forming the ancient medina. 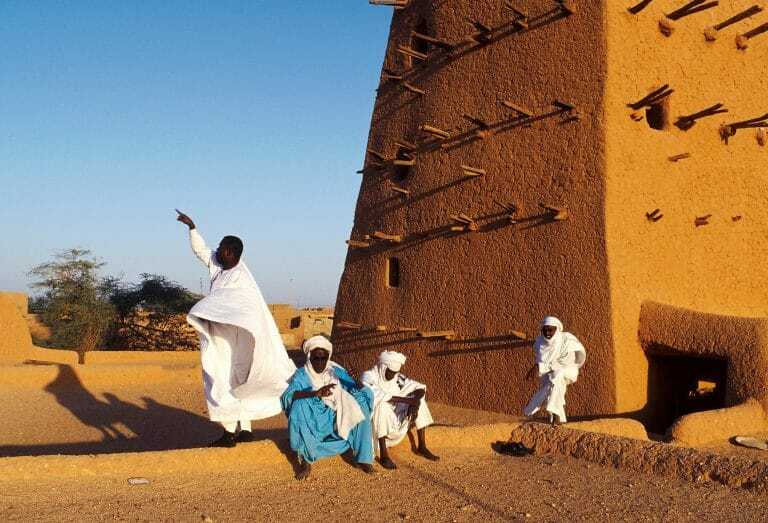 Terraces – which in the Sahara work as roofs and are tightly connected – are still used for open-air sleeping on summer nights. In the past, the terraces that easily connect different neighbourhoods, also functioned as paths which were traditionally reserved for women, so they could move freely across town far from the gaze of men. 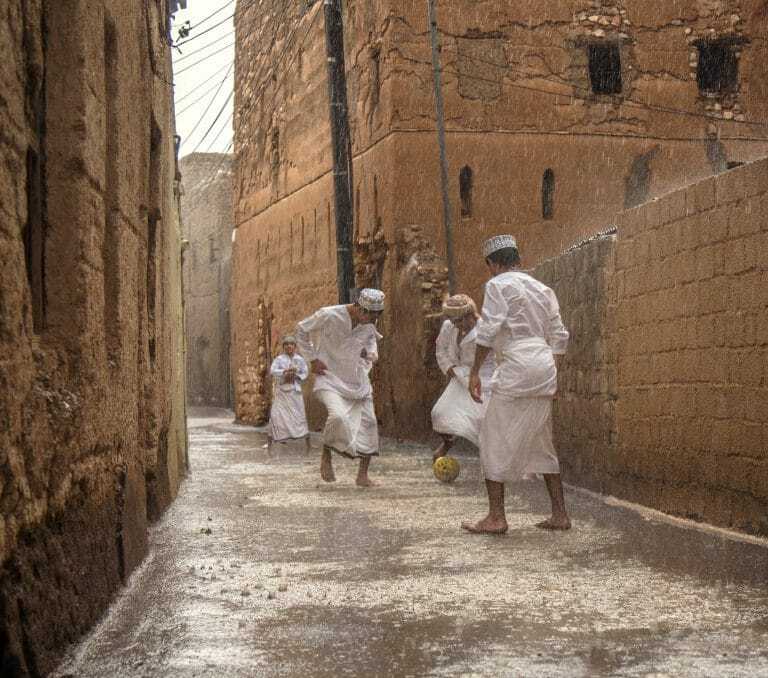 Secret itineraries, providing the wooden frame for covered passageways that punctuate the old town, are used as community gathering places even today. a physical network, bringing together the associations working in the oasian communities, connecting national and international bodies, scientific institutions, NGOs and the private sector, to promote the sharing of knowledge and skills, identify problems and projects that offer innovative solutions to the social and environmental emergencies affecting the Saharan and Arabic Oases. There is a need for a coherent approach towards the issue of water, taking into account, in the variety of trans-national, national and local contexts of the Oases, the effects of climate change, the diversity of each geographic region in relation to the local hydrogeological setting, the water collection and irrigation techniques, the water infrastructure present in each territory. A water capital that must be identified, making the most of it to ensure its availability, its regeneration and prevent its pollution, necessarily incorporating new technologies which rediscover the value of systems based on traditional knowledge. Innovative practices in the management of soil, water and energy resources, are necessary to the survival of the entire planet, not only to prevent the disappearance of Oases. It is true, however, that in the desert environment such measures cannot be postponed. For this reason, in agriculture, effective water management will also depend on solar power. The use of such technology can be aimed to supply energy to the collection of water by the wells in the palm groves. An extraction which, thanks to the particular technology of solar pumps, is achieved without depleting the resource. With the addition of a further result: the reintroduction, through such an innovation, of the traditional collective water management customs, the starting point of life in the Oases. 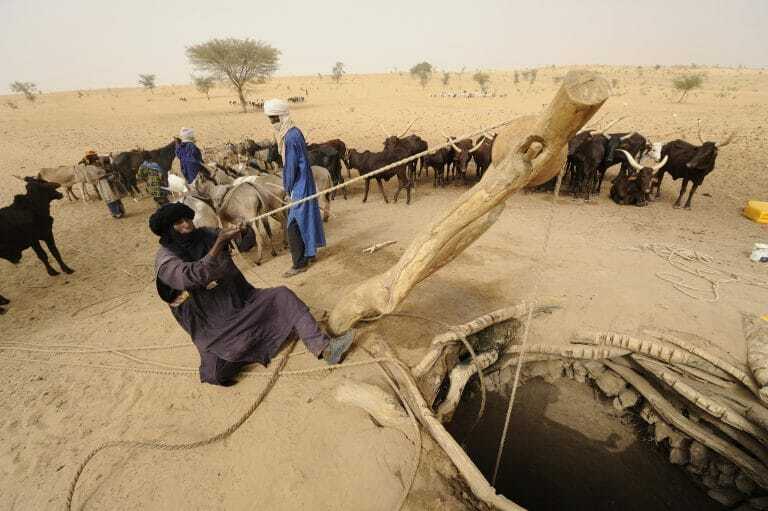 By moving away from the use of individual, one household wells, which together with climate change has led to the exhaustion of groundwater, farmers in the Oases can return to associate among themselves, both to share the yield of a single well, managing and subdividing the flow at fixed times, and to bear the installation costs. 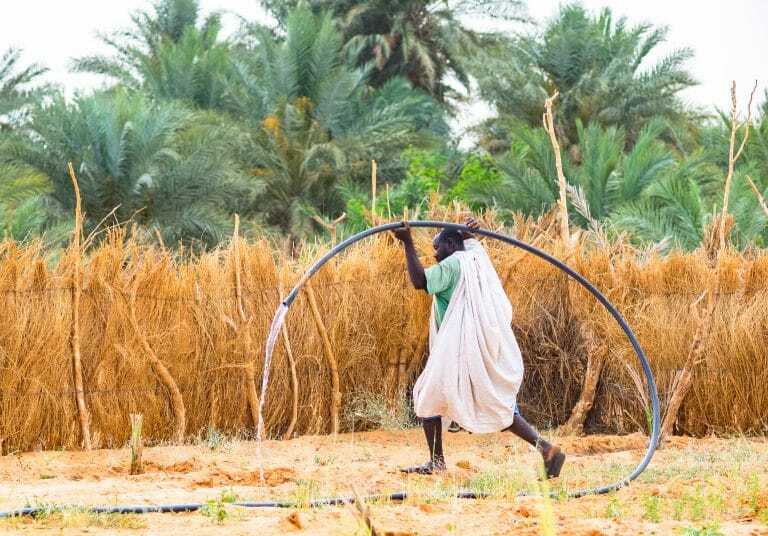 Traditional agriculture in the Oases, organised around family consumption, is not a mere production system but, rather, a practice necessary to the survival of the Oasis itself. Farmers in the Oases today need to employ tools which enable them to cope with water shortages and to receive special training. No only, the sum of practices which sustain locaL agriculture – an unprofitable activity compared to one practiced on industrial scale – must be guaranteed adequate recognition. Support and funding must benefit those farmers who still employ them as, aside from preserving biodiversity, they safeguard the uniqueness and aesthetic quality of the landscape, a crucial element in bringing added value to local products. It is, after all, only from the beauty of an image, about a particular and unique landscape, that we can summarize the “typical” properties of a product, be it agricultural or artisanal. To this, a kind of “seal of excellence” is, very simply, affixed. A recognizable, albeit intangible, attribute which increases its chances of accessing wider markets. 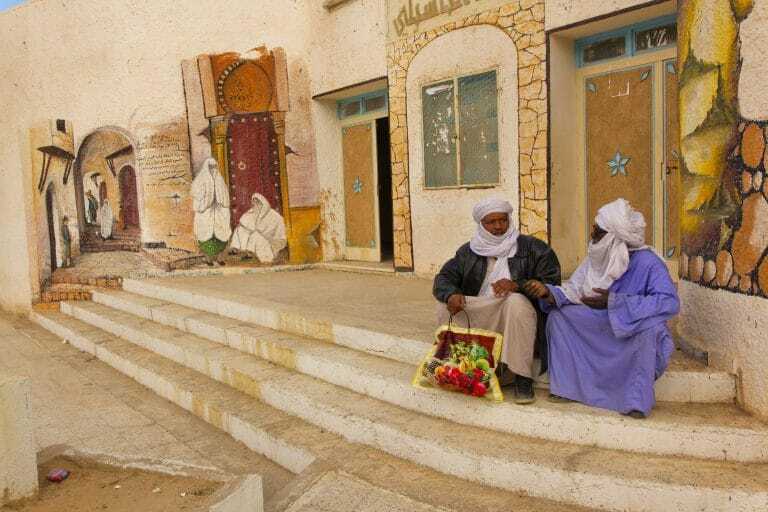 Giving life back to the traditional, often semi-abandoned, villages in the Oases is possible, provided that the restoration work is aimed at returning to the community, first and foremost, the spaces dedicated to collective life. Such interventions must take into account their inherent aesthetic qualities, valuable and necessary visual representations of cultural and spiritual values. In this way, public spaces and some of the old buildings can be returned to religious ceremonies and traditional festivals; this “recovered” use can be the starting point for a gradual rediscovery, that is also symbolical – as a place of representation and belonging – for all its inhabitants. For this to happen, the re-appropriation by the community must begin in the very early planning stages: communicating with the former residents and getting them involved in the restoration project fosters direct participation, the rediscovery of local history and segments of collective memory. To this we must add the involvement of workers who are still able to use indigenous materials and local techniques, passing on their skills to the new generations. Thus begins a process that, in time, might spread to other parts of the village, leading to the renovation of private homes, where some can return in the summer season or during Ramadan. The total destruction of the village, which occurs as a result of the erosion and sanding up caused by neglect, could, once again, be averted. Tourism can be seen as a double edged sword: an opportunity to showcase Oases and their cultural heritage that will allow their survival or, otherwise, the agent of a degradation which brings their end closer. When it comes to landscape, the integrity of which is crucial to the touristic appeal of the Oases, the greatest risk comes from construction of new neighbourhoods and new hospitality structures in the vicinity of the old villages. Projects which are authorized and executed without taking into account the aesthetic and functional criteria inherent to such places, and not least erected using building materials which are inappropriate not only in respect to the architectural context, but also to the climate. Energy-consuming buildings, conceived according to criteria which are increasingly found to be unsuitable even in a large metropolis, and which, in the Oasis, are meant to signify modernity, end up altering its appearance and weakening its touristic potential. What can easily be done instead is the recovery of traditional village buildings and their promotion as excellent hospitality facilities, adopting policies and strategies that subordinate financial support to the maintenance of local architectural features. Other facilities that deserve to be promoted are those shaped by local nomadic tradition, tented accommodation with a very low environmental impact, located in the desert or in the proximity of an Oasis, wonderfully integrated within the natural environment and suitable to withstand the harsh desert climate. 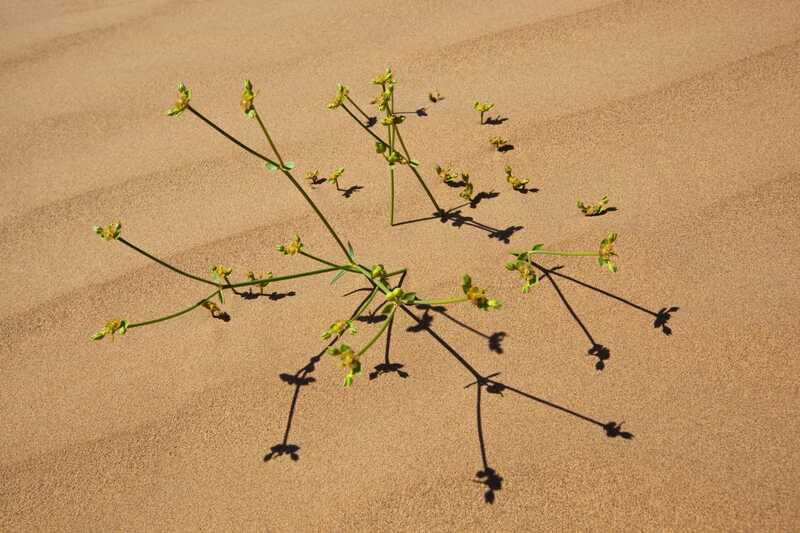 Actions that safeguard life in the Oases are effective when local communities get involved in decision making and have their say about the international cooperation programmes and national policies that affect them directly. Precondition for this to happen, are new forms of self-organization of the local actors, able to create new spaces for debate: forums dedicated to the identification of needs, priorities, strategies, to which village women and youngsters bring a contribution, all of them being traditionally absent from the assemblies with government functions in the community. In addition, training activities involving the various sectors which are the very foundation of the Oasis’ integrated economy, should be implemented. These being a valuable occasion for an extensive exchange between communities located far apart from each other, equally affected by the changes induced by new socio-environmental scenarios. Here, the identification of current problems is followed by the possibility of sharing solutions that combine innovation and local knowledge.